Received the »Certificate of Typographic Excellence« from the Type Directors Club New York 2018! Shortlist »Die schönsten deutschen Bücher« by Stiftung Buchkunst 2017 and Walter Tiemann Preis 2018! How can the transformation of spatial, interactive or cinematic projects onto the page enable new perspectives and experiences? 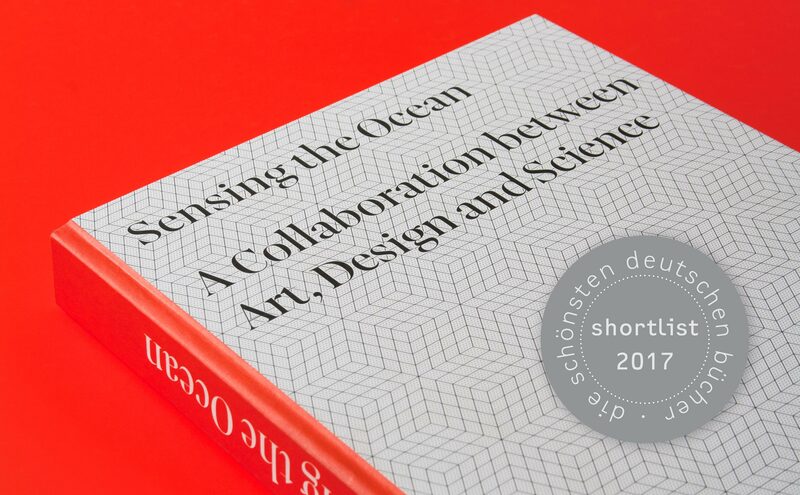 The publication »Sensing the Ocean«, which was released after ten years of cooperation between the Muthesius University of Fine Arts and Design and scientists within the Cluster of Excellence »The Future Ocean«, presents not only various texts on the relationship between art and science but also three practical projects that originated from the cooperation with the Cluster. These multimedia-based or three-dimensional projects demand a representation in the book that gives the reader the opportunity to experience them. Since a complete reproduction or reconstruction is impossible, the three projects from the fields of exhibition design, science visualisation and film are shown in different ways. Instead of just focusing on a mere documentation, this publication uses the medium of the book to create a new view on the projects through reflexion and analysis. These illustrations of space, interactivity, and time range over several pages and thus form a core element of the publication. They all share one design element, namely a kind of »zoom«. In the style of atlases, one first sees an overview of the work, details are nearly indiscernible. Selected pictures are then, by and by, shown in different stages of enlargement so that the single picture, the details are focused on. To make this approach comprehensible for the reader, these stages of enlargement or »zooms« are illustrated in schemata. Through the combination of the schema and the corresponding pictures, the projects can be experienced not only rationally but also emotionally. A link is made to the ambivalent title of the publication »Sensing the Ocean«. The method of enlarging is also used on the pictures integrated into the texts and works as a way to combine the various elements inside the book through design. In collaboration with Björn Schmidt.